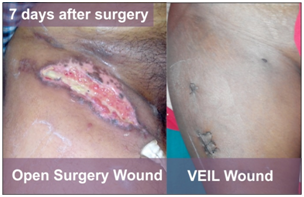 Conventional open inguinal and ileo-inguinal block dissections are notorious for wound related problems (about 60%) which needs weeks of nursing to heal (Photo shows the wounds after 7 days of surgery). Wound related problems prolong recovery in these patients leading to suffering, increased cost of care, etc. With laparoscopy the trauma is much less and makes the treatment more acceptable. The Team MACS precisely addresses all these issues and works relentlessly for a better life. WHAT IS THE INGUINAL & ILIAC REGION ? The groin region in medical term is called inguinal region. The lower portion of belly (abdomen) that is covered by the hip bone is called iliac region. 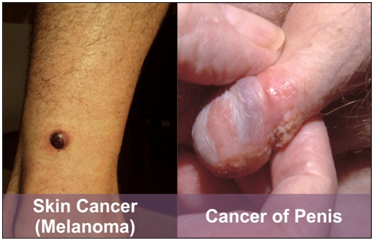 The region is important because of the presence of a large number of lymph nodes (small nodular structures that are present throughout the body that clear the tissue fluids) which drain lower limb (legs) and genital areas. WHEN IS INGUINAL AND ILEO-INGUINAL BLOCK DISSECTION PERFORMED ?